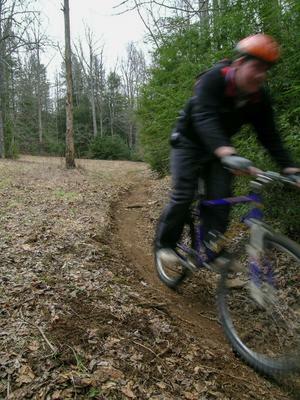 This is your guide to individual trails in the Mills River area. 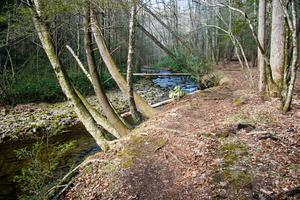 Here is a list of all trails in the Mills River Trailhead area. 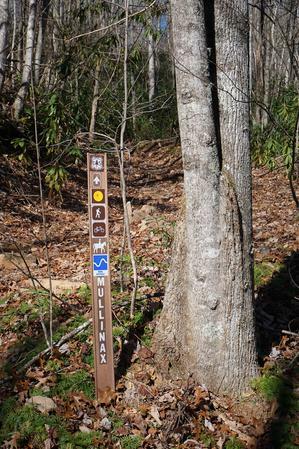 For general information about the Mills River trailhead, see the Mills River Trailhead page. Follows the creek uphill, starting in a clearing. 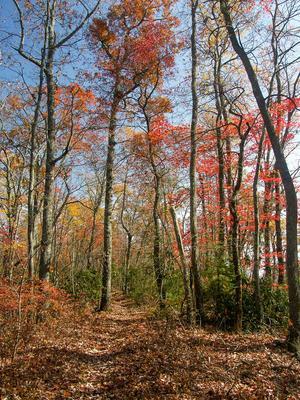 Travels through mostly white pine and dead hemlocks, then into hardwoods mixed hardwoods near the small stream. Crosses and then ends on FS 5001, making a loop hike possible. Follows one of the larger tributaries of the North Mills River. Many creek crossings on the lower half. 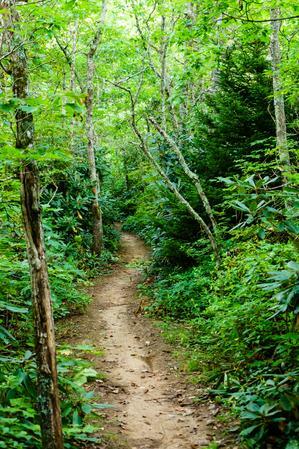 Steep climb up the Pisgah Ridge on the upper half. High elevation change. Creekside, backcountry trail. Numerous water crossings will require wading; not passable in high water. 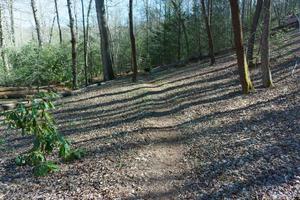 May require pathfinding skills - trail disappears into the creek at times. Passes small dam on Bradley Creek. Sparsely maintained. 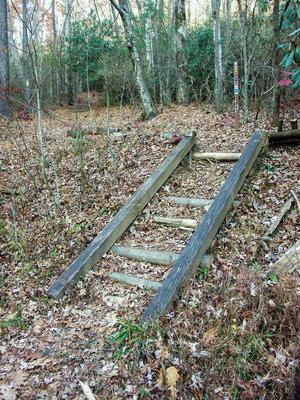 Passes old Cantrell Creek Lodge site. 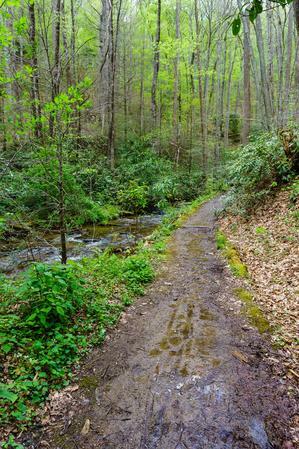 Trail merges with creek at times. Follows the creek closely at lower end. Switches back & is very steep at upper end as it climbs the ridge. Short; moderately steep. Mostly mixed, high elevation hardwood forest. Rocky in places. 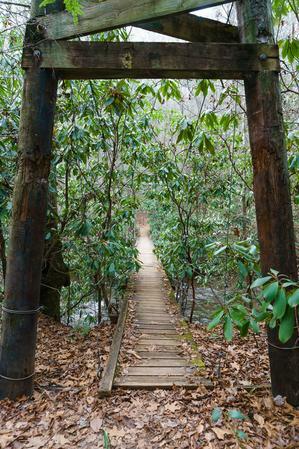 Scenic and mostly level, but many river crossings where the trail is difficult to follow. River crossings may be impassible in high water. 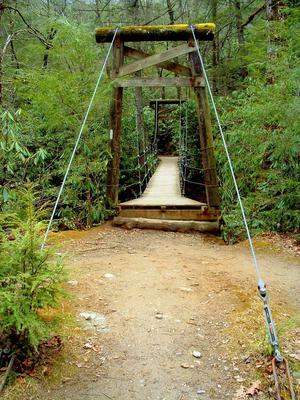 As its name implies, this trail follows the river (South Mills) and Bradley Creek, both of which you cross several times. Scenic. Expect to get wet up to your knees on this one. Impassible in high water. Old roadbed. 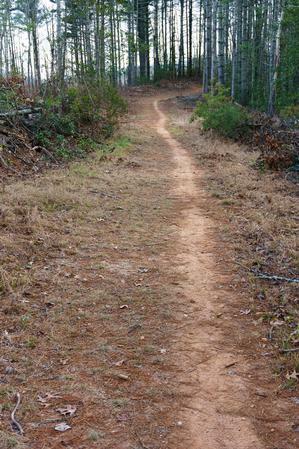 I've seen deer on this trail nearly every time I've traveled it. Short connector from Hendersonville Reservoir Road, FS 142, to the Trace Ridge trail on an old road bed. Crosses a small seep and passes into a recently logged area near the junction.